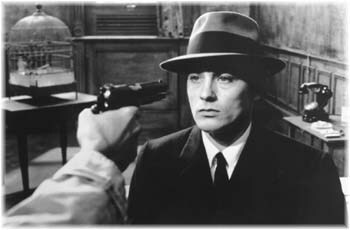 Making a Point: Existential gunman Jef Costello (Alain Delon) stares impassively down the barrel of his own fate. THE ADMIRATION of Quentin Tarantino and John Woo (and also, no doubt, of cartoonist Frank Miller) has helped give Le Samourai, an underpowered 1967 French crime melodrama by Jean-Pierre Melville, a reputation as a classic. Maybe not a classic, but classic in style, at any rate: formal, deliberate, measured--a crime movie that looks as if it just came back from the dry cleaners. Jef Costello (Alain Delon) is the samourai of the title, a gunman without emotions or friends, who really has only two things in the world: a pet bird and the admiration of a jane named Jane (Nathalie Delon). After Jef executes a nightclub owner for pay, he is shot at and wounded by the man who hired him. Now the police and the criminals--both urbane, both unruffled--are after him. The transition from the cops' lair to the gangsters' office is so smooth it looks like a reverse angle of the same room. François Périer, as the polite, double-dealing officer in charge of the investigation, is perhaps worse than the crime boss. Delon's legendary cool is shown off in the wardrobe that was the model, so Tarantino claims, for the black suits of the Reservoir Dogs. Jef is always making sure his creases are crisp and his fedora is straight. It's not so much a case of clothes making the man as clothes erasing the man. It's a handsome film. Each composition is precise, and the photography by Henri Decaë makes even the police station look as softly lighted as an expensive restaurant. Still, it's always clear that you're watching a handsome replica of an old Allied Artists/Monogram detective movie and not anything closer to the bone than that. Even Delon's cool becomes aggravating in one too many slow-speed foot chases through the guts of the subway. Often, Le Samourai is like watching a surreal documentary about the towing of a nattily attired mannequin on a long tour through the less interesting parts of Paris. Le Samourai (Unrated; 95 min. ), directed by Jean-Pierre Melville, written by Joan McLeod and Melville, photographed by Henri Decaë and starring Alain Delon. From the July 10-16, 1997 issue of Metro.